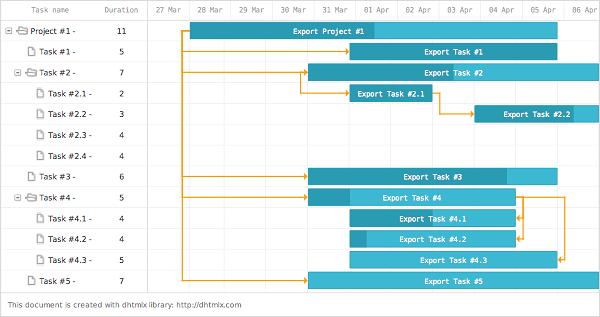 If you need to print a Gantt chart that you created with dhtmlxGantt, we now provide an online export service that allows you to export your chart to PDF or PNG formats. To see how the export service works, try this demo. If you need technical details, read this article in the documentation. Note that this export service is available online only, there is no installable version of it. Export service uses SSL (Secure Socket Layer) for all data operations, so your data can’t be intercepted by any third parties. During data export we are not saving any informaton. The exported file is not stored on server as well. In other words, your data is safe, secure, and available only to you. By default, the generated PDF/PNG document includes a watermark. If you want to remove the watermark, you can buy the export service for one domain for $70 per year. The users who have dhtmlxGantt Commercial/Enterprise License can use this service without a watermark on one domain within the support period (30 days for Commercial License, 12 months for Enterprise License). This period can be extended ($70 per year). For more details, contact us at sales@dhtmlx.com. Looks nice. Do you have something similar for the dhtmlxScheduler ? We also plan to release the updated online service for dhtmlxScheduler (the same as for dhtmlxGantt, export to PDF/PNG) during this or the next month. Is it possible to include elements rendered using AddTaskLayer to the export? I’m adding some custom elements and they are not included in the PDF or image export.